iKey introduced the first wireless IS keyboards in 2009, making them the first-known, completely sealed IS keyboards on the market with wireless capabilities. The BT-87-TP-IS and DW-5K-IS receives Factory Mutual approval for use in Class I, II, and III, Division 1, Groups C, D, E, F and G locations. The DW-5K-IS requires three AA batteries and a USB dongle isolated from the hazardous location to operate. The DW-5K-IS features an integrated HulaPoint II pointing device and measures 14.97” x 6.61” x 1.91” (width-height-depth). 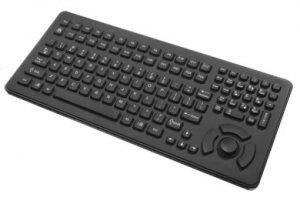 The BT-87-TP-IS is a Bluetooth-compatible, submersible keyboard that does not require a USB dongle if the host computer is also Bluetooth©-compatible. It needs two AA batteries for power. The BT-87-TP-IS features an integrated touchpad and measures 12.01” x 7.75” x 2.03” (width-height-depth). Both of iKey’s wireless IS keyboards have a 30-foot RF range. They are built with a sealed, industrial silicone rubber keypad and a rugged ABS polycarbonate case. Each of the keyboards meets NEMA 4X specifications, with the ability to withstand dirty, wet and corrosive environments. In addition, iKey manufactures both of these products in nonincendive versions that are Factory Mutual approved for use in Class I Division 2, Groups A, B, C, and D locations (BT-87-TP-NI and DW-5K-NI).